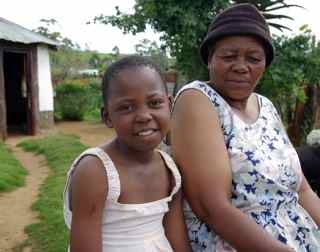 Healthy again: HIV-AIDS orphan Mbali Mdlovu, with her gogo (granny). 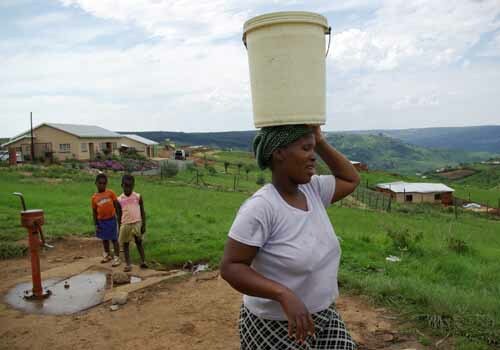 The Ufafa district, near Ixopo in KwaZulu-Natal, South Africa, is home to around 23,000 people. Families reside in a sprawling muddle of family compounds that stagger up hills and tumble into valleys, forming a jumbled patchwork of mud, thatch, concrete block and tin. The dwellings have no electricity. Water for drinking, washing, cooking and bathing is hand-pumped from underground wells and carried in plastic bucket and barrels. Unemployment hovers at around 84 percent. HIV-AIDS statistics among women are among the highest in the world. It is an area where children know more about grief and loss than games and laughter. A place that could conceivably have been forgotten. But — was it serendipity, karma or the fickle finger of fate? 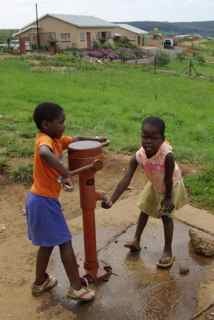 Ufafa children play at the water pump near the Woza Moya offices. On a Sunday evening in 2000, the proverbial butterfly of chaos theory flapped its wings on one side of the world in the guise of a talk by two young Buddhist teachers to a meditation group in San Francisco. The reverberations — which continue to amplify — resulted in the birth of Woza Moya (Zulu for “come the spirit”), a poster-child women-run nonprofit that is serving as a lifeline for 7,000 people — and counting. Back on that fateful night, Tennessee native Randy Weinberg and his British-born wife, Mary Weinberg, had been teaching at the Buddhist Retreat Center for six years. The couple, better known by their Buddhist names, Kittasaro (Randy) and Thanissara, “talked simply about their lives and experiences in South Africa,” recalls retired San Francisco nursing sister Gayle Markow, who was in the audience. “I have this abiding memory of Thanissara telling us how, in their first year at the Buddhist Retreat, one gardener died; and then another. Then they noticed there were people dying all around them. Woza Moya manager Jane Nxasana — committed to her community. Deeply moved, Markow, a retired nursing sister, told fellow members of San Francisco Insight about the “sister hospital” concept, where a hospital in a wealthier country commits to helping one in a poorer country. “I suggested our sangha (Buddhist community) use this as a model for a ‘sister sangha’ relationship with the Buddhist Retreat Center in South Africa. The Buddhist Retreat Center — a haven of tranquility. The Buddhist Retreat Centre, perched on a ridge on a property comprising 300 acres of grassland, indigenous bush and forests — land with slopes too steep and temperatures too harsh for agriculture — is a haven of tranquility in the Ufafa area. 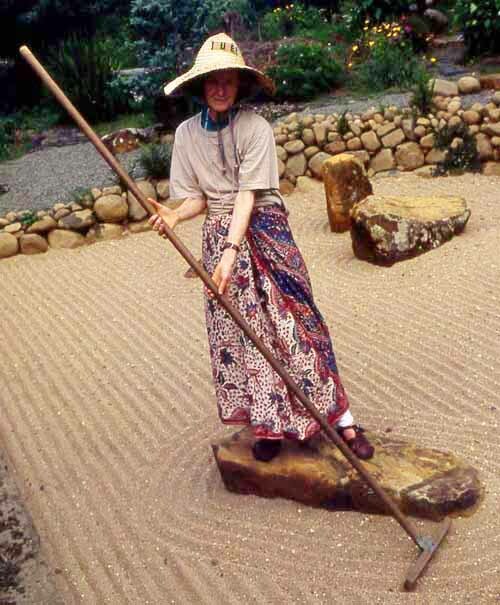 June Atkinson in the BRC zen garden. Atkinson, a long-time stipended staff member from Zimbabwe, resulted in the construction of a secondary school in the area. The center had seen the HIV-AIDS pandemic take hold and devastate the already ravaged community around it, and had long wanted to take action but lack of finances hindered it from doing much. The early seed money from San Francisco got the ball rolling. Sue Heddon, a Zulu linguist running volunteer literacy classes at the BRC at the time, was assigned to research and write a grant proposal. She consulted with the Aids Foundation of South Africa and in 2001, Woza Moya — with Heddon as director — was launched from a small office in the BRC grounds as a community project focusing on HIV-AIDS prevention, training and home-based care. 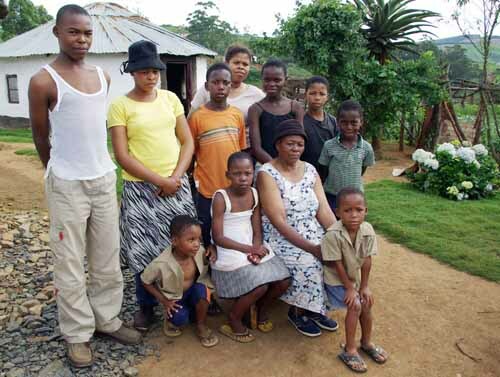 Mbali Ndlovu sits with her gran, now “mom” to several HIV-AIDS orphans and other grandkids. The San Francisco group followed their initial gift with two large fundraisers held in successive years. “None of us had been to South Africa so very far away, but our community felt honored being able to do something,” says Markow. Their efforts raised around $40,000 — enough to construct a community centre, designed by van Loon, on a swath of tribal land with sweeping views, assigned by the local chief. The Woza Moya community centre opened in 2005. 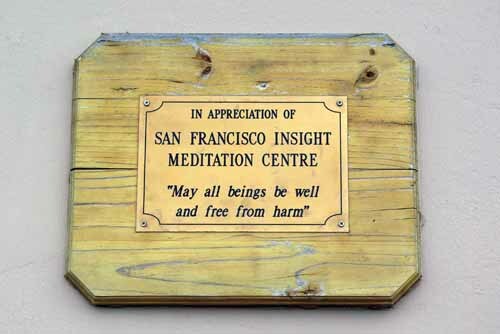 A plaque to the left of the front entrance reads: “In appreciation of the San Francisco Insight Meditation Centre — May all beings be free from harm”. The plaque: Gratitude to San Francisco Insight. Woza Moya manager Jane Nxasana, 42, is friendly woman with a direct gaze is prone to delicious fits of giggling that are contagious in their effervesce. But she admits she is often moved to tears by what she sees. On a recent morning, Nxasana introduced us to members of her small team who, with an expanding group of local and international Buddhist Retreat Centre supporters, are giving life and hope to people in the area. Water is pumped by hand and carried back home. From its humble start, Woza Moya has become a community beacon monitoring vulnerable children; giving at-home hands-on help to the sick, vulnerable and dying; paying thousands of home visits; organizing hospital and clinic visits and ARV treatment programs; helping people procure identity documents and grants; arranging and distributing food parcels; teaching about nutrition and helping families plant vegetables gardens; running support groups for orphans and grandmothers; collaborating with other nonprofits for funding and functional help, and a lot more. Jane Nxasana, left, with Woza Moya team members Gudane Mthembu (paralegal), Benedicta Ndlovu (co-manager), Dumile Mdladla (youth co-ordinator) and Star Ndlovu. 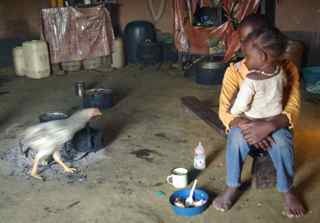 Mbali Ndlovu, now 11 years old, is one of innumerable Woza Moya success stories. The shy little girl has no memory of her factory worker father who died when she was 3 years old. In April 2007, when her mother died of AIDS, the child — HIV positive and with active tuberculosis — was close to death herself. Thanks to the support Woza Moya was able to provide, she is now healthy, doing well at school and living with her grandmother. “At this point, the number of new infections is increasing with no sign of reaching a natural limit. The epidemic is now at a stage where large numbers of people are becoming sick and dying of HIV and AIDS. Our hope and vision is to expand this care and support program to as many families as possible,” says Woza Moya director Sue Hedden. A child feeds her sister inside a one-roomed home. The poverty in the area is extreme. Since the community center was built, other funding — some from Buddhist groups in the UK — has facilitated expansion that includes a children’s playroom that doubles up as a garage for the Woza Moya vehicle at night. Hawaii-based South African Buddhist teacher Gavin Harrison visited the BRC in 2008. Spurred into action by what he saw when Kitissaro and Thanissara took him to visit Woza Moya, he went back home and raised the equivalent of R600 000. The money will fund an on-site clinic facility. 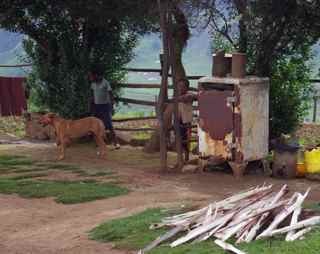 One of Mbali Ndlovu’s cousins plays in the yard. Each new funding effort is a brick in the wall. There is still monumental work to be done. Additional support groups and job training programs remain pressing needs. It is hard to believe that a short talk on a Sunday night in San Francisco could have led to all that has come about so far. But — “It is totally thanks to the San Francisco sangha that all this has happened,” says Thanissara. 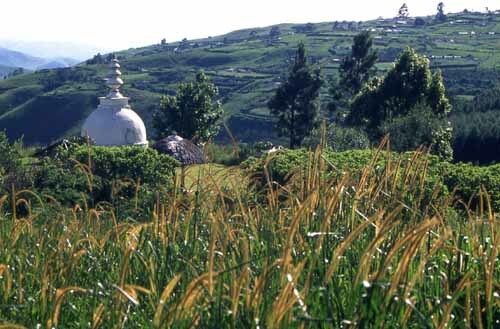 Kittisaro and Thanissara offer residential retreats at their hermitage, Dharmagiri, near the town of Underberg in the Drakensberg mountains. Click here to read a February 2009 news story on the launch of their new Khuphuka (“rise up”) project, as reported in The Witness, South Africa. 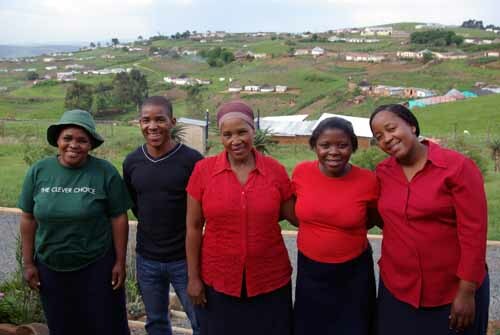 Modeled after Woza Moya, their intention is to facilitate HIV/Aids home-based care and paralegal advice in the community near their hermitage. Once again, funding support came from San Francisco Insight. “There is a lovely road that runs from Ixopo into the hills. These are grass-covered and rolling, and they are lovely beyond any singing of it.” So reads the scene-setting opening of Alan Paton’s classic novel, “Cry, the Beloved Country”—a book completed in San Francisco on Christmas Eve in 1946. San Francisco Insight, an offshoot of Jack Kornfield’s Spirit Rock Meditation Center at Woodacre in Marin county. See more on Spirit Rock. For information and links on HIV-AIDS in South Africa, see Aids Foundation of South Africa. By all means share this story, but please link it back to this site. Short extracts may be republished with the permission of the author. See contact page for contact info. Awesome story. A powerful testimonial to having a vision for the greater good. This is so inspiring. It makes me renew my commitment to the ones who cannot speak for themselves as well as we can. Thank you for bringing this out. I loved your article about Ixopo and the excerpt from Cry the Beloved Country. I think it has persuaded me now to drive up to Natal and spend some days there. There’s a lovely Buddhist retreat centre in Plettenberg Bay, called Sat Chit Anand, but I’m sure you know about it. It is lucky I found your web site. Just a single suggestion: It’s will be much easier to follow if your web site can present rrs subscription service. Pray daily to be positive in life and stay focused in education. You might want to check out this ayurvedic healing centre in india.